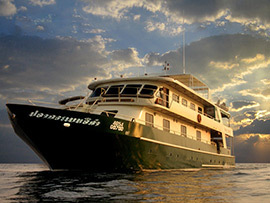 Black Manta is a top class liveaboard for diving in Indonesia. After several years of cruises in Thailand and Malaysia, the Black Manta relocated permanently to Indonesia in 2010 running trips in Komodo and Raja Ampat. We have a special offer for an upcoming trip on 26th June - 1st July 2014, a 5 night trip in Komodo starting with a flight from Bali on the morning of the 26th and flying back to Bali on the morning of the 1st. 16 dives in total.